South Africa’s import and export industries are thriving. On the whole, South African individuals and organisations exported more than R101 billion worth of goods in September 2017 alone, boosting both the country’s economy and the profits of local exporters to the tune of a R4 billion trade surplus. Apart from those included on the SARS list of Prohibited and Restricted Imports and Exports, international trade can involve almost anything you can think of. 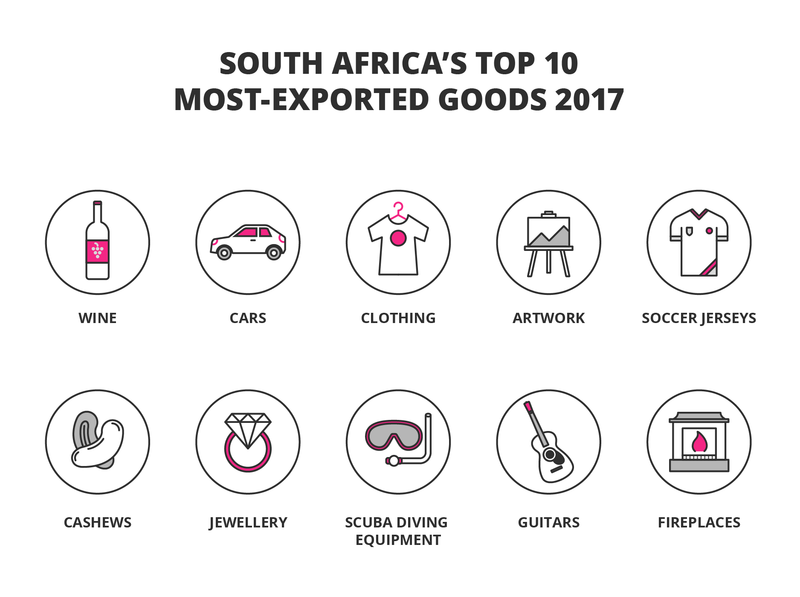 South Africa’s top 10 most-exported goods for 2017 are craft supplies, wines, cars, clothing, artwork, soccer jerseys, cashew nuts, jewellery, scuba diving equipment, guitars and fireplaces. The majority of the goods on this list are small, easily-acquired products of the country’s unique culture, heritage and climate. This makes it easy for you as an aspiring exporter to find a local supplier of cashew nuts, a producer of South African wines, or an artisanal jewellery maker, and start your own lucrative export business. But before you begin your journey towards making money from export management, you need a solid understanding of the costs and payments associated with exporting goods from South Africa. Whether your aim is to make a bit of money on the side, or grow your interest in export management into a fully-fledged business, an import and export course such as the UCT Import and Export Management online short course will equip you with the knowledge and expertise you need to navigate the complexities involved in exporting to make a profit. In terms of container rates, a ‘box rate’ will be charged for a full container load, regardless of its contents. Ocean freight rates are normally quoted on the basis of ‘full liner terms’, meaning the loading and off-loading costs are included in the freight rate. This option makes the most sense for you if you’re looking to export a large amount of goods, or few very large products, such as a shipment of fireplaces or a large order of scuba diving equipment. When it comes to less container load charges, they’re similar to those of FCL, but shipping costs are based primarily on volume, by which the shipper is charged a minimum of one cubic metre. This works best for exporters looking to transport a smaller amount of expensive goods, like cashew nuts or jewellery, but in a shared container. When considering bulk and break bulk cargo rates (cargo transported in bags, boxes, crates, drums, or barrels – not containers), a shipping line’s tariff is based on the freight ton, which is either 1,000kg or 1m3. The shipping line will deduce a rate per freight ton for your exported goods based on the classification of your product, and apply it to the mass or volume, whichever is more expensive. This is something that you as an exporter will need to be aware of, as it can lead to some steep transportation costs. If you’re exporting a product that qualifies as ro-ro or roll-on-roll-off cargo (such as trailers and semi-trailers), freight is usually charged according to the linear footage occupied by the cargo, while a flat rate is charged for motor vehicles. Use of the ship’s towing vehicles is charged for by the hour, and use of the ship’s handling equipment is charged for by the voyage. This would make the most sense for exporters sending individual large items by sea, such as motor vehicles. This rate is then adjusted upwards by a fuel surcharge and a security surcharge (introduced after 11 September 2001). If you’re looking to send cargo via air, you need to remember airlines have a minimum rate, meaning a standard fee for cargo less than 45kg. When considering air freight as a transport option, keep in mind airplanes are limited in the weight and volume they can carry. When cargo is big and bulky, you need to confirm with the airline that the goods will fit into the cargo door of the plane. Rates associated with sending your cargo via road transport differ from one operator to another. Some transporters will quote per kilogram (volumetric or actual weight – whichever is the highest) or a fixed price per truckload. Road transporters charge a premium on the transportation of abnormal loads because of all the people, permits, special arrangements and time involved in moving a load of abnormal dimensions. If you want to make money from exporting goods from South Africa, it doesn’t need to be an arduous task. Your share of South Africa’s R4 billion trade surplus is waiting for you, all you need to know is how to navigate the complex world of shipping and couriering. Ready to turn your exporting dream into a reality? Download a prospectus to find out more about the UCT Import and Export Management course. 5 min Looking for your niche in the sharing economy? Here’s a few ideas to get you started.